Contractor Buys in L.A. For $36.7 Million: In the biggest single-family home sale so far this year in Los Angeles, Ronald Tutor, chairman and chief executive of building contractor Perini Corp., paid $36.7 million for a massive, not-yet-completed house in the Beverly Park gated community. 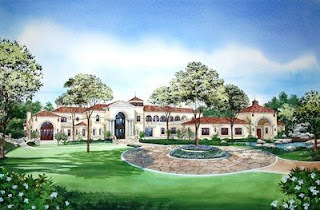 The 27,000-square-foot Tuscan-style stucco home will have nine bedrooms, 18 bathrooms, a movie theater and a gym. The 3.55 acres include a pool, a tennis court and a guest house. Mauricio Umansky, of Hilton & Hyland, had the listing. Mr. Tutor was the longtime chief of Tutor-Saliba, a closely held general contractor that's merged with Perini and whose projects include the Bay Area Rapid Transit-San Francisco International Airport extension. The seller was Lee Kort, an operating partner in California-based mobile-home-community operator Kort & Scott Financial Services, who paid $10.5 million for the vacant lot in 2005 and listed the house this spring for $49 million. Tracy Maltas, of Sotheby's International Realty, represented Mr. Tutor. Click "Read More" to view actual home and location.